Click on the topic(s) below to read about valuable "Before You Cruise" information! Packing is sometimes something that can make or break a vacation. The one essential item needed is left at home. Trying to replace that item costs twice as much as it did at home. The bags are too heavy to check at the airport or the dreaded lost or delayed bags. Here are some basic tips to help make this essential part of the vacation easier and more organized. 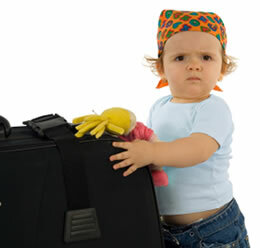 One of the more important things to remember is to divide the family members' belongings into multiple checked bags. That way, if one is lost, then everyone will still have some clothes to wear until replacements are made or the bag is found. Carry-on anything that is essential and that can't be lived without if a bag is lost or delayed. Travel insurance can sometimes help if bags are lost or delayed. Recently, new policies are being enforced at airport screening and check-in regarding the carriage of liquids, pastes, gels, and aerosols in carry-on luggage. The United States allows travel size toiletries that are 3 ounces or less that fit comfortably into one quart size (or 1 liter) clear plastic zip-loc bag. Similar policies are being enforced in Canada, the United Kingdom, and the European Union. Liquids that are purchased at the airport once you are through security do not need to fit within the same policy. Each country has their own security measures in place and should be researched before traveling to or through any country. When planning out a wardrobe, keep in mind the types of events that you will be participating in. Does the ship have formal dinners? Is a hike through the jungle on the itinerary as a shore excursion? Check the weather forecast of the destinations you plan on visiting to aid packing. Packing for a cruise might lead to additional challenges with the variety of outfits that are needed for a single day. Minimize what is packed by planning outfits that will look different by simply changing tops with a pair of black or khaki pants or by adding a sweater or wrap to a simple black dress. Iron everything before it goes into the suitcase and button all buttons and zip all zippers. Try to fold your clothes they way it is done in clothing stores to minimize creases. T-shirts, jeans, skirts, and sport coats can be rolled and put into a duffel bag. Placing tissue paper between layers of clothes also helps prevent wrinkling. Always pack as tightly as possible to minimize wrinkles. Try to unpack as soon as possible and if wrinkles still happen, most cruise ships and hotels have an iron that can be used or clothes can be hung in the bathroom while taking a hot, steamy shower. Beach towels are not needed, as they are provided for use onboard the cruise ship as well as at ports-of-call. Carry one dollar bills to tip. General rule for tipping is one dollar per bag. Tie a bright strip of fabric or ribbon to your luggage for easy identification at the airport or pier. Keep important documents together and close at hand. Make copies of everything (documents, photo id, passport, etc.). Keep one copy at home with someone and the second in your carry-on. Check with the cruise line/ hotel before packing a port-a-crib. Most offer them to you, generally at no additional charge. Making a list helps alleviate items being left at home. It also helps with the problem of over packing. Keep a running list during travels and as you think of other things that can be helpful for the next vacation. Below is a list of some general items and some essentials that would be helpful on a cruise or even a land vacation. Curling Iron/ Curlers/ Hair Straightener, etc. Toothbrush, Toothpaste, Mouthwash, Floss, etc. There have been so many changes in required documents and custom regulations over the last few months; it is hard to know exactly what is needed when you travel. Below are a few guidelines to help you get started. 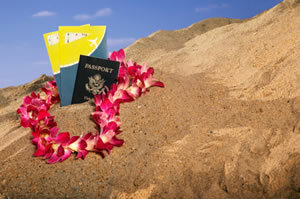 Having a passport, even when it is not required, will offer many benefits while traveling. It is a single document that provides photo identification as well as citizenship. No more messing with having a birth certificate, a driver's license, and sometimes even a marriage license. It eliminates the worry of loss or damage to those precious documents. Passports add a measure of security when traveling. In the unlikely even that you must return home during your cruise from a foreign port, you will already possess the appropriate identification needed to travel. While cruise ships do not require passports yet, airlines do! You are always ready to travel anywhere you wish on a moment's notice. Get away for the weekend. You're needed for a business conference in a foreign country. Having a passport on hand eliminates the need for expediting charges. It is recommended that you apply for your passport as soon as you know you are traveling. The average time to process a passport at this time is as many as 12-15 weeks, sometimes taking longer. Check the state department's website for current processing times. 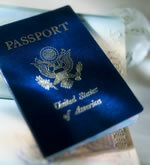 It may be necessary to expedite the process if you need your passport soon. Everyone, including U.S. Citizens, traveling by air must present a valid passport, Air NEXUS card, or U.S. Coast Guard Merchant Mariner Document, or an Alien Registration Card, Form I-5551, if applicable (effective January 23, 2007). This includes any stops, layovers, etc. in any of these countries even if your final destination does not require a passport. As early as January 1, 2008, this policy may extend to everyone traveling by land and sea (including ferries). This policy does not apply to U.S. citizens traveling to or directly a U.S. territory. Territories include the following: Guam, Puerto Rico, the U.S. Virgin Islands, American Samoa, Swains Island, and the Commonwealth of the Northern Mariana Islands. U.S. citizens must provide proof of citizenship in the form of a passport, original birth certificate, a state-issued certified copy of a birth certificate from the Department of Health and Vital Statistics, or the original Naturalization papers. All guests over the age of 16 must provide an official photo ID. Passports will be required for all cruise passengers no later than June 1, 2009. Please be aware that this effective date may be moved to a date as early as January 1, 2008. Many cruises recommend that guests travel with a passport now since it will greatly expedite clearance by the Department of Homeland Security. A passport will also be required to re-enter the United States if you unexpectedly depart the vessel prior to the end of the sailing. Additional documents may be required depending on your citizenship and where the cruise ship departs from. To know exactly what is needed to travel, check with your travel consultant or directly with the cruise line. It is essential that the name on the passport matches the name on the booking whether traveling by air, land or sea. Please refer to the State Department's website for any changes that need to be made to your passport. Many countries require that your passport be valid for six months after the completion of travel. Ensure that there are enough blank pages for entry and exit endorsements or any visas that may be required. Be sure to allow sufficient time to renew your passport and/or obtain additional pages. The Passport Card (also referred to as the PASS Card) is a limited-use passport in card format is currently under development and will be available for use for travel only via land or sea (including ferries) between the U.S. and Canada, Mexico, the Caribbean, and Bermuda. It is not a globally interoperable international travel document. Similar in size to a credit card, it will fit easily into a wallet and offer a less expensive alternate to the standard passport. Visit the State Department's web site, State Department website, or call the U.S. National Passport Information Center at (877) 4USA-PPT. You will need to allow at least six weeks for processing. If your travel is urgent and you will require a passport sooner, it is possible to expedite the process. The State Department's web site will provide details. Your cruise line will send you documents either electronically or through the mail that you will need to board the ship. There will be several forms that will need to be filled out prior to embarkation either on paper or electronically on the internet. You will need to take those written forms or a printed confirmation with you to the pier. The cruise line will need a form of photo identification and proof of citizenship. A passport is the easiest form as it proves both. If you don't have a passport (and are traveling before June 1, 2009), you will need a photo ID, a birth certificate and a marriage license if you are married and are no longer using your maiden name. Please check with the cruise line to know exactly what is required as it may vary by cruise line and by the ports that you are traveling to. Weather is always an issue where ever you are. It is needed with packing and making travel arrangements as well as planning out an itinerary. Cruisers often wonder about the type of weather that may be encountered while on a cruise. The easiest way to know is to check the internet sites that predict weather like weather.com and accuweather.com. They will let you search across the world and usually 10-15 days in the future so you have a general idea of what to expect before you arrive. Remember that the weather can change at any time. Buying travel insurance that covers disruption in case of weather-related events can help with weather's unpredictability. It can be through the cruise line or an independent provider. Your travel consultant can help you find the best policy to fit your needs. 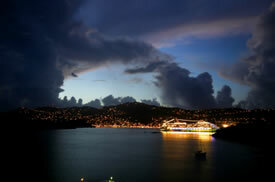 Stormy weather may be an advantage on a cruise vacation when comparing it to a resort on land. If a storm is coming, the cruise will just sail out of the way. There is always the chance for a small shower here and there but it won't ruin your vacation. Temperatures are only given in Celsius from Thailand on. Hurricane season encompasses the months of June through November in the Caribbean and the Mexican Riviera. The southern hemisphere (Australia and New Zealand) deals with cyclones and other similar storms during the months of March and April. With the unpredictable nature of hurricanes, it is not always possible to know information about itinerary changes in advance. The cruise lines have a priority to protect their guests and crew, as well as their ship. Cruise lines would rather avoid than confront a storm. Specific hurricane/ tropical storm emergency response plans have been developed that cover everything from designating a bridge office as weather monitor during the season to outfitting ships with top of the line satellites. Hurricane season is not the time to make a visit to a particular port a crucial part of your vacation. The captain reserves the right to change the itinerary at any time to ensure the safety of the guests and crew. The ship may visit other ports or there will be additional days at sea. Itinerary changes can happen during any season. Although ships have the technology to evade the storm, there is a change that they will still encounter rougher waters. Seasickness remedies are generally offered onboard should a guest require it. As you would expect, the weather of Alaska can be very cold but it is not as bad during the cruise season (May through September). Cruise ships visit places with lots of ice and may offer a shore excursion that will take you dog-sledding or on a trek across a glacier. Temperatures vary based on the time of year and the port and is often unpredictable. Average daily highs range from 54°F to 75°F during the cruise season. Most days are comfortable, but it is important to dress for warm and cold weather. Temperatures and weather in Hawaii vary little from place to place, with exceptions at the higher elevations. Average annual temperatures deviate little from 75°F. Jackets may be needed for the cooler evenings. Water temperatures average 74°F reaching up to 80°F during the summer months. Rainfall varies tremendously according to location. Mild rain and wind storms are more frequent during the winter months (November through April), but they generally clear within 24 hours. Severe storms are uncommon (hurricanes, tropical storms) and will generally make landfall every eight to ten years in the Central Pacific. Few hurricanes come close to the islands and only three have made landfall in the past 50 years. Most of the season is spent enduring tropical storms. Their annual hurricane season is June through September. Overall, the weather is beautiful in the Caribbean. Average daily temperatures in the Caribbean range between 70°F to 90°F with water temperatures around 80°F. It can get cool in some places along the coast during the evenings whether on land or on deck. Local rainy seasons depend on where you are in the Caribbean but generally are in the summer or fall months. This does not mean that it rains all of the time during these months. Generally, there is a short outburst followed by sunshine. The cruise season in Europe is generally April through November, with some lines cruising into December. 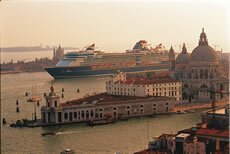 Some cruise lines sail year round in the Mediterranean. The seasons in Europe are very distinct with great variations in temperatures and weather in the different locations. July and August are the warmest months. Average temperatures in the low- to mid-60°F's, although weather may be milder in Ireland. August, September, and October tend to be the sunniest months. Average temperatures above the Artic Circle are in the mid-50°F's, in the south in the 70°F's. Denmark tends to have the mildest weather. The fjords may be rainy. Average temperatures are in the high 60°F's in Holland and Germany with possible rain in May. Belgium has temperatures in the low 70°F's. The sunniest weather is in July and August. Paris has average temperatures in the mid-70°F's with the Riviera in high 80°F's or above. The best weather is in the late summer with average temperatures in the 70°F's. Temperatures range in the high 80°F's or warmer, but there may be nice breezes along the coast. Portugal tends to be cooler and rainier. Greece and Turkey are the hottest. The best time to visit Greece and Turkey is in mid-April to June and mid-September through October to avoid the hot weather. Average temperatures and weather conditions vary greatly depending on where you are. Typhoons and rains may occur in some locations. Typhoons are avoided much like hurricanes and tropical storms. The cruise lines have a priority to make sure their guests, crew and ship are all safe. Average temperatures vary depending on location. 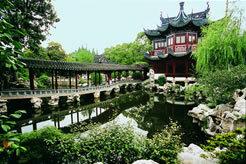 Generally the best time to visit is in the spring or fall because of the better temperatures and lower tourist crowds. Beijing has extreme temperatures with very warm summer days (May through August: 70°F's and 80°F's) with cold winter temperatures (January: low- to mid-30°F's). Hong Kong's weather is very hard to predict. December to March see a lot of rain (winter temperature range in the 50°F's and 60°F's). June through September is very hot (80°F's and 90°F's) with high humidity. Summers in Shanghai are hot, humid, and rainy while the winters are cold and dry. Temperatures in the summer can soar into the 100°F's. Average temperatures vary depending on location. Hiroshima has a very mild climate, with low humidity and little precipitation. Temperatures are in the 80°F's and 90°F's in August and in the low 40°F's in January. The summer months in Osaka are hot and humid with a lot of rain. The hottest months are July and August with an average temperature around 85°F. The winters are mild (40-50°F) and may have an occasional dusting of snow. Rainy season is in June and July and typhoon season is June through November, but the storms rarely wreak havoc on the city. Nagasaki has one of the warmest climates in Japan with much rain especially in the summer. Temperatures in the summer range between 75-95°F. Taiwan has a subtropical climate. Temperatures are above 77°F between June and September with a rainy season between August and November. December through March is the best time to travel with temperatures in the 70°F's and 80°F's. Pusan, on the coast of Korea, has an oceanic climate with an average temperature of 59°F with cool summers and warm winters. The wind blows strongly in comparison to other areas and protection from the wind may be necessary. Heavy rains arrive in May during the Southwest Monsoon to the south and central areas. Temperatures can soar in the coastal regions during this time. The Northeast Monsoon arrives in October and lasts until January. Heavy rains are common in the south and central areas in September and November. The wet season turns the countryside lush green with tropical vegetation and the vibrant colors make it a great place to visit despite the rain. The best time to travel is December through April. India often gets heavy rains during the summer months with warm temperatures ranging between 77-95°F year round. Cruise lines typically schedule their itineraries during the cooler months. Thailand is hot and humid most of the year with the warmest temperatures in March through May. Temperatures average in the 80°F's and 90°F's/ 27°C-32°C with a rainy season from June through October. Vietnam has two climate zones. The moderate northern zone has two seasons with winter from November to April and summer from May to October. The tropical southern zone has a cold season from November to January, a hot season from February to April and the rainy season from May to October. It is commonly struck by typhoons. The average January temperature is 81°F/ 27°C and the average July temperature is 84°F/ 29°C. Temperatures are tropical year round with average day temperatures of 88°F/31°C and night temperatures of 77°F/25°C. Indonesia has a dry season during May through October which is typically the best time to travel. It is important to remember that their seasons are opposite of those in North America. The summers begins in December, however the mild climates make both destinations popular cruise destinations any time of the year. Australia has a typhoon season that runs December through May and will affect the ports of Brisbane and Cairns more than Sydney. New Zealand is south of the cyclone belt and is not affected. The summer months of December through March are a great time to visit Melbourne. Temperatures range between 70-80°F (21-27°C). The rest of the year can bring wet and windy days. Adelaide has a very Mediterranean climate. The Southern Ocean creates hot, dry summers and cool, mild winters. 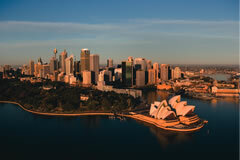 During the summer months (December to February), Sydney's coastal temperatures range in the mid 70°F/21°C while inland temperatures can reach 100°F/38°C. Rainfall is most common between February and June. Auckland, New Zealand offers a warm coastal climate. Average winter temperatures are around 58°F/13°C, though they will vary greatly. Spring months are unpredictable and can be sunny, cold, hot, or rainy. The summer months (December to March) offer the most consistent weather with average temperatures up to 75°F/ 24°C. Rain showers are less frequent but can still be common. The Northland enjoys a subtropical climate with their summers from November to April with plenty of sunshine during the day and warm, balmy evenings. The days are not too hot and don't have the humidity of the tropics. Afternoon temperatures in the spring and fall are around 73°F/23°C. January and February are the hottest with the winter months of June, July, and August generally mild with temperatures often reaching 68°F/20°C. The Great Barrier Reef is a popular destination for cruise passengers. Seawater temperatures range from 73-84°F/ 23-29°C in July to February. The climate around the reef is mainly tropical, with a wet and monsoon season between November and March. Afternoon showers during this time are not uncommon and the occasional electric storm may be possible. The dry season has temperatures in the upper 70°F and 80°F's/25°C and begins in May and ends in October. The days offer sunshine, fresh breezes, and low humidity. The best time to travel is between April and October. Between November and March Tropical North Queensland is home to the box jellyfish, so special swimming enclosures are erected at popular beaches to protect swimmers. The islands of the South Pacific are considered tropical and the weather can be divided into a wet season and a dry season. The wet season is between November and April. The humidity during this time can be heavy and muggy and a cloud cover is common. Storms can be frequent, brief, and unpredictable. Temperatures range from 80-86°F/ 27-30°C with little variance from day to night. The dry season is typically tourist season (May through October). Temperatures range between 75-82°F/ 24-28°C and rain is rare. 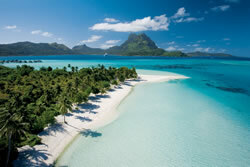 Some islands may have higher temperatures depending on their location to the equator. Rainy season may vary from island to island. 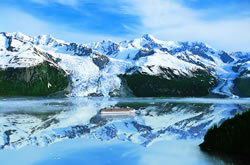 The Antarctic Peninsula can only be reached by cruise ships from mid-October to early March. December through February generally have the best weather, making them the best months to visit. Days can be sunny and clear with temperatures averaging around 30°F/ -1°C. Nights are very brief and much colder. Heavy winter clothing is imperative. Be prepared for high winds, blowing snow, fog and freezing temperatures. Can I check-in for my cruise in advance? That varies by cruise line, but many do offer the chance for you to check-in and fill out all of the necessary paperwork online before you go. Doing so will expedite your boarding and skip the forms at the pier. The boarding time of the ship will be specified in your documents. The latest a guest may board the ship is one hour prior to the scheduled sailing. Most cruise lines operate on a cashless system. Your cabin key serves your boarding identification card and your ship charge card. You will need to put a credit card, traveler's checks, debit cards or cash down with the cruise ship prior to sailing. A running tab will be kept and you will receive an itemized bill prior to disembarkation. Guests placing a credit card on file and there are no discrepancies, the amount will be charged upon disembarkation. If you used traveler's checks or cash to activate the card, you will need to settle the account before disembarking the ship. Many lines will require a deposit if you choose the latter method. Absolutely! The importance of travel insurance can't be stressed enough. See the article on Travel Insurance to see why you will need it. Should I let the cruise line know of any health conditions? Absolutely. Most cruise lines require notification of any major disability whether you are blind, deaf, use an oxygen tank, are in a wheelchair, or recently had a heart attack. This benefits you as well as the cruise line because they can make special arrangements if necessary. And don't forget to request, if appropriate, one of your ship's cabins that are specifically designed for passengers with disabilities (especially those in wheelchairs); typically, these cabins have wider doors, more open space and bathrooms with roll-in showers. Do I need to let the cruise line know of dietary restrictions? The cruise lines typically require advance notification at least a couple of weeks prior to embarkation for more challenging dietary restrictions such as kosher or salt-free. The easiest is the low fat or vegetarian diet which will be available on practically all cruise line menus. Cruising with kids can be an adventure as well as a relaxing time for the parents. More and more kids are sailing the seas each year, and the cruise lines are catering to them. You will find family friendly programs and amenities from the luxury to the low-key ships. Many come with their own exclusively kids' programs. Knowing which is right for your family no matter the age of your kids makes all the difference when planning your vacation. Plan with your kids and let them know what to expect when they embark on the ship. Show them pictures of the ship and the ports. This will help alleviate any anxiety they may feel in a new place. Plan for younger ones to spend some time playing in the children's programs, so you can enjoy the romantic dinner you have been waiting for. They may decide that it is more fun being in the children's area that it may be difficult to get them to leave! 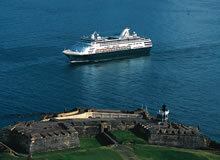 Check with the cruise line first and foremost to find out the minimum age to travel. It varies from as young as 12 weeks to 4 months old and even to 6 years old. Disney Cruise Line® allows babies as young as 12 weeks up to 36 months in their full service nursery. Space must be reserved in advance. Even if you don't need the nursery, they will provide everything from cribs to pureed vegetables right to your cabin. They will also provide pagers, as will Princess Cruise Line®, if you are needed to be reached for anything. Other baby friendly lines include Norwegian Cruise Line. 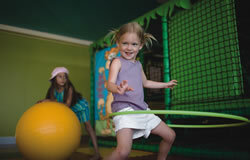 They provide a playroom where children can play accompanied by a parent. Many of the family friendly cruise lines will offer a splash zone in the pool area for this age range as children in diapers are not allowed in the pools. The children's programs on most ships are flexible to fit your schedule. Your kids can decide to spend one hour in a day or all day every day! Depending on the line, the kids are divided into various age ranges and will have their own area of the ship. The kids get to hang out with kids their own ages and do fun kids' stuff. These programs are not intended to be daycares. They are designed for families to enjoy quality family time together as well as the choice for the kids to be with peers of their own age whenever they choose to be. Most programs have the standard video games, scavenger hunts, and art projects. Each of the cruise lines will offer something a little bit different than the competition. Teens are entertained throughout the day and into the evening on a cruise ship. Cruise ships create facilities, often with a coffee shop atmosphere during the day and a swinging teen dance club at night. They are free to come and go as they choose. Activities where teen can meet with other teens are arranged throughout the cruise. They can enjoy social interaction with peers their own age at pool parties, teen discos, and special theme parties. There are all types of trivia contests, games, and sports including basketball, volleyball, and ping pong. Pizza parties, beach parties… the list of teen friendly activities is endless. 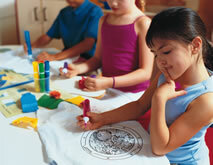 Teens can also opt to participate in special classes just for them. They could learn how to take care of their skin and the latest hairstyles. Get a few tips in photography and paint a t-shirt. Some lines offer teen only shore excursions that are geared to their interests. Teens can opt to explore the enticing ports in a supervised group with new friends. Other lines offer teen spa services. There are plenty of activities outside of the children's and teen programs, too. Hang out in an arcade. Play a game of basketball, swim, slide down the waterslide, or play a round of miniature golf. Play ping pong, explore the ship, see a show, and always have something to eat! The list could go on and on of activities available on a cruise ship. 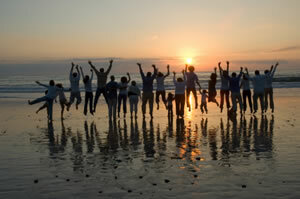 Does your family love to get together and have a good time? Are you looking for a great way to meet up with old friends on a reunion? Do you have a group of people just looking for someway to getaway together? Why not plan a group cruise? Cruises cater to everyone, no matter their taste or vacation style. Everyone can find something to do that they enjoy. Cruises allow for your family or group to spend time together, but also time alone when you need a break. Uncle Bob can head to the casino. Aunt Mary soaks in the sun by the pool. Dad wants to play trivia in the sports bar. Mom is shopping in the duty-free shops on board. The kids are headed to the kids program and you can indulge in a massage at the spa. Then come together at the end of the day for a delicious meal that you didn't have to cook or clean up the mess for. There are many perks to booking into a group on a cruise. Prices may be lower than individual rates. Guests have the freedom to choose the cabin class making it affordable for everyone. By setting up a group, members of your group may have the opportunity to cruise for free. It depends on the numbers and each individual cruise line. Some of the cruise lines may offer amenities to your group. This can be anything from cabin upgrades to complimentary wine and chocolates in each stateroom. You may be able to reserve private meeting space or have a private cocktail party. Are you ready for an adventure? Ask your travel consultant for details on booking a group cruise.